You want to stir the milk and sugar until it’s fully disolved. 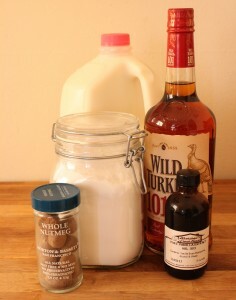 Then mix in the bourbon and vanilla. I used Wild Turkey 101 because I wanted a little extra kick. 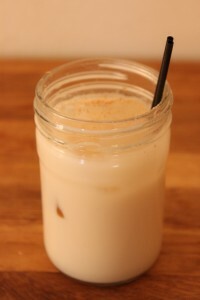 I also upped the bourbon to 16oz per batch (it was tasting like sweet, seasoned milk with only 12oz). You then pop everything in the freezer. The Times suggests leaving it overnight and defrosting in time for consumption the next day, but if you’re doing same-day delivery, 5-6 hours ought to get it down to a good, half-frozen temp. Let it thaw slightly and then serve with a a health dose of fresh nutmeg shavings. The freezing pulls the water out of the dairy leaving sweet creamy goodness. The nutmeg helps the vanilla and caramel flavor of the bourbon shine through. What you get is chilly but somehow warm drink that you’ll feel down to your toes.